Sorry, I put the last pic on to help date the set. I forgot to mention why. 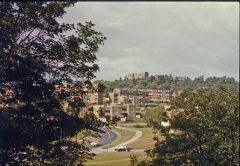 I lived in the maisonettes at the top of the hill in the middle of the picture. Thanks for a great shot. Some pics from when it first opened. I loved the paddling pools at Millhouses park. The Lido too when I got older. Here are couple of pics from around 1963 when I visited as a toddler. My how things have changed. Thanks for all the relies. A few more to rack your brains with. The last one is building The Milestone pub at Crystal Peaks. Yes there was four colours and the alarm sounded every 15 mins to call a colour in. I went to Arbourthorne Central Infants and Juniors. I have just found this pic on a box my father had. If I remember correctly this is a trip to Riber Castle Zoo. Circa 1969. I can name maybe half of the kids here, I had forgot all about these school friends. Random pics, do you have any idea of the year? I found these pictures in an old photo album. Judging by the dates on others in the album, I believe my father took them around 1990. Does anyone recognise the subjects or have more information? I went there most nights from 1979 to 1983. I preferred the middle diving board as you could do stunts and better dives from there. I remember trying to soak the attendant that sat on the chair opposite the boards. I managed it a few times. Another thing we would do late in the evening is dive into the kiddie pool. You have to dive really flat to manage it. I was sad to see it go as it was a fun pool and didn't have the serious atmosphere of Pond's Forge. I got most of my girlfriends there, no mean feat as I suppose the goods were on show . I even met my wife there. I had heard that the pool was built 2 metres short deliberately so that it would no be used for events and be free for the public. Here is the demo. That being said, I paid £120 for the equipment in 2002. So it is probably better quality than what I posted earlier. Have you considered something like this? I used something similar 10 years ago and the results were good. I'll post a video as a demonstration later. Thanks Dave, I miss-read it as 8mm film. I will leave my advice on here in case others want it.